Good day, Nexites, and welcome to a new edition of Deck of the Week. In my relentless pursuit for the “next big thing” in Modern, I found another gem that we could try, and maybe polish, for the coming days. Without further ado, let’s take a look at this undefeated deck from one of MTGO’s Competitive Modern Leagues. 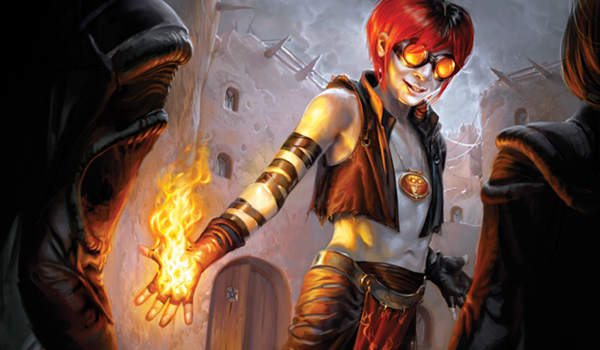 Modern is arguably in its finest state since the format started. There is no superior deck, and there are multiple ones that you could sleeve up to a tournament and help you go all the way. For the third week in a row, I was able to find an innovative take on an existing archetype that might be able to “crack” the stalemate in the format. This Mardu deck looks more like a Burn deck that’s supported by some of the best black and white cards in Modern right now. Discard spells such as Thoughtseize and Inquisition of Kozilek are key components of any deck that’s running black, because it keeps you out of trouble against combo decks such as Counters Company and Gifts Storm. Lightning Helix nullifies the life loss from the shocklands, fetches, and Thoughtseize, while helping you get ahead against aggro decks. Lingering Souls is very good in this deck because it gives you chump-blockers when you’re on the defense and a resilient threat with evasion in control or midrange matchups. The red cards in the deck are all gasoline. Young Pyromancer is at the center of attack, with 30 instant and sorcery spells in the deck that all act as enablers for its ability. Bedlam Reveler is the mid-game changer, as it allows you to draw three cards as soon as it hits the battlefield (assuming you’ve spent most of your spells in the earlier turns). Faithless Looting gives you the option to filter your hand if it gets filled with lands, or if you need to fill the graveyard with more cards to help Bedlam Reveler come to play earlier. There’s also a singleton Blood Moon that could shut down a lot of decks when it hits play. The rest of the red spells all deal direct damage to the opponent. In a format where getting ahead is crucial, but coming back from the depths of death is more important, this deck is in a good position to contend with higher-tier decks such as Grixis Death’s Shadow and Humans. There are some pieces that I’d love to alter in the deck, but for now I’ll leave it as it is and give it a test drive. If you have some ideas of what we could do to improve it, just let us know in the comments section below. So that’s it for this edition of Deck of the Week. Stay posted for our next feature next week. Until then, happy shuffling and thanks for reading! Can you share your list, Aaron? I’m also enticed by the idea of making a Jund-based burn deck. “This mardu deck looks more like a burn deck”… because of its… four bolts? The deck is a grindy attrition deck where you loot into gas, hit them with discard and removal and try to grind them down with tokens. Reveler w kcommand is your ca engine (recur revelers as needed). Yes there are two swiftspears but those are amongst the most cuttable cards in the list at a glance. I do not see any dimension where one would say “its basically burn”. Its full of interaction and looks to go long, generally winning with tokens or revelers – yes backed by an occasional bolt to the dome. By “looks more like a burn deck”, I was actually referring to how it strayed away from the usual midrange-like concept of Mardu decks that relies on more creatures, but I get your point. I’d love to cut the swiftspears for other cards. I didn’t go into much detail on what I would take off the list, because other players might have something else up their sleeve using the same color base. Thank you so much for explaining how it works, though!